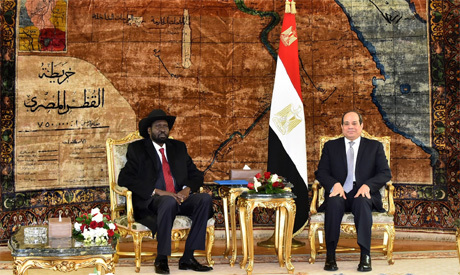 Egypt is keen to support stability and security in South Sudan and boost mutual cooperation with the country, President Abdel-Fattah El-Sisi told South Sudanese counterpart Salva Kiir on Thursday. 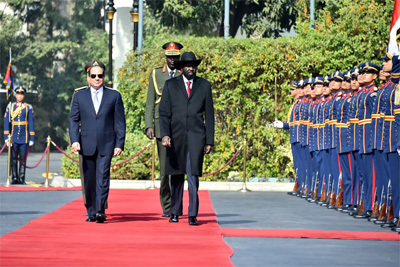 Kiir arrived in Cairo on Wednesday for a two-day visit. 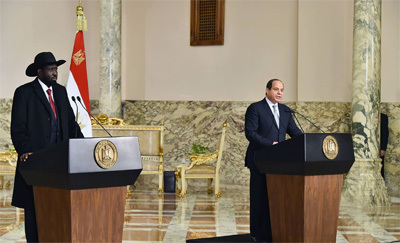 The two leaders held a meeting at Cairo's Ittihadiya Presidential Palace followed by extensive discussions between delegates from both countries. El-Sisi emphasised "Egypt's complete and unlimited support for South Sudan's efforts to achieve peace and stability in the country as an extension to Egypt's national security," El-Sisi's spokesman Bassam Rady said in a statement. The two leaders discussed the latest developments regarding the implementation of the peace agreement between government and opposition forces in South Sudan. The two leaders also discussed a number of regional issues including in Nile Basin countries and the Horn of Africa. President Kiir expressed his country's appreciation for the close cooperation with Egypt, praising Egypt's sincere support for a solution to the conflict in South Sudan and its humanitarian efforts there. Kiir also spoke about the pivotal role Egypt has been playing to support stability in Africa, which have qualified the country to chair the African Union in 2019. Egypt's relations with South Sudan are currently seeing an "unprecedented boom," El-Sisi said in a speech during a joint press conference with Kiir on Thursday, emphasising Cairo's continued support for South Sudan's peace-building, stabilisation and development efforts. In September, President Kiir signed a peace agreement with rebel factions to end a five-year civil war that has killed an estimated 400,000 million and crippled the country's development since it gained independence in 2011. In his speech, El-Sisi urged the international community to fulfil its commitment to backing South Sudan in its advance towards development. The Egyptian president said the two countries look forward to further strengthening their ties. "Our discussions today reflected the determination of the two countries to move forward with bilateral relations and push them to a wider level in a way that enables us to make the best use of the economic and investment opportunities available," El-Sisi said. The two leaders last met in September in Beijing on the sidelines of the Forum on China–Africa Cooperation FOCAC 2018.